Why Make ‘Chaldean’ an Issue? Zinda Magazine is now also available in Adobe Acrobat format. You will need Adobe Acrobat Reader to view this document. Yalda is a Syriac word; it means ‘birth’. It is also a word traditionally used in the Farsi language to signify the longest night of the year – the Eve of Birth or Shab-e Yalda. In reality, it refers to the Winter Solstice that occurs every year on December 20-21. The Romans believed it was the night that their Sun God was born. Later the Roman emperor, Constantine adopted this day to signify the birth of Jesus Christ, his majesty’s newly-adopted Saviour. It is possible that the term ‘Yalda’ entered the Persian language during the persecution of the Nestorian church in Mesopotamia. Interestingly today, “Yalda” – a concept rooted in pre-Christian affirmation of the life-giving forces of nature, can still conjure up the sacred images historically associated with the revered symbols of Christianity. The last day of the Assyrian month Kanoon I (or ancient Kislimu) is the longest night of the year. From this day until the first day of Neesan (90 days later) the days will be getting longer and the nights shorter. Neesan portends the victory of light over darkness, life over death and good upon evil. It is the month of celebrating the return of the Assyrian deity Tammuz from the underworld where he had been a prisoner of hatred and jealousy. This event is marked around the time when Christians celebrate the Resurrection of Jesus Christ and the triumph of the Light and the Truth. Every year at this time, we are reminded of the power of giving. It is only through giving of ourselves that the lifeless can be revived and the hopeless souls attain confidence in the future. Christmas, denuded of its commercial values, is simply a celebration of the birth of Esho Msheekha, an unconditional gift from the Father in heaven. The gift-giving tradition on the eve of December 25 or January 6 stands to remind us of the one gift Christians around the world cherish as the ultimate sign of devotion and love – the gift of life exemplified by the death of Jesus on the Cross. Gifts we exchange to remind us of the great gift of life – one that we can share with others less fortunate. After a decade of economic sanctions in Iraq, the failed policies of the Kurdish Regional Government, the economic shortfalls of the feeble governments in Georgia and Armenia, and the continu discriminatory course of action in Turkey, no amount of denial can hide the truth about the dejected condition of many Assyrian communities around the world. In the ashes of this inferno stand the children of tomorrow’s Assyrian nation, trapped in the refugee camps of Jordan, Australia, Mexico, Italy, Germany, Holland, Austria, Pakistan, & elsewhere. Thousands more attend Assyrian schools in North Iraq uncertain of their future threatened by the pending war with the most powerful nation on earth. Everyday, with nothing more than the most basic elements of survival, these little boys and girls struggle to make a future for themselves and their families. The cost of a single cup of Caffè Latte at your local Starbucks coffee shop can feed a girl in Jordan for an entire week and provide an elementary school boy in Arbil with an entire year’s worth of school supplies. Enough apathy and denial! This is the next Assyrian generation – languishing before our own very eyes – one that must one day define the course of history for the decades to come. Our ignorance will soon have dire consequences and only a significant populous effort can overturn the demise of a proud nation; one that is rooted in love and afforded through unconditional gift of giving. Every Assyrian, living in a relatively comfortable and secure state has the strength to enrich the lives of other Assyrians, briefly or forever. Whether it is a one-time gift or one that lasts in perpetuity, a meaningful monetary contribution toward the relief efforts around the world allows us to reach out and support the less fortunate brothers, sisters, and their children. From all of us at Zinda Magazine and our families a very Merry Christmas to you and you families. To honor the memory of Alexander Gabriel (d-Mart Maryam d-Mdita) born ca. 1900 and died 1979 (?) 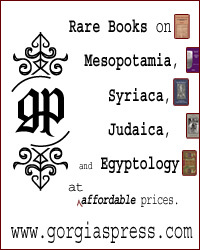 in Philadelphia, a fund has been created at Harvard College Library, called the Alexander Gabriel Memorial Assyrian Preservation Fund. Alexander Gabriel was a man who, had he been born as a national of a recognized state, would have risen to the highest rank. As it was he did his very best to promote the important Assyrian causes of his day. Trained at the Misia (Russian Orthodox school system) in Urmia, "Alaksan" Gabriel was the eldest of three brothers who survived the Genocide. The details of his life remain to be unearthed but he did spend time in Tiflis, and perhaps elsewhere in the southern Tsarist Empire. He next appears in the Assyro-Chaldean Protectorate serving in the military under Malik Qambar d-Malik Varda d-Jilu. He also served as the secretary to Malik Qambar in the latter's petitions to the League of Nations. He spend time in France, probably in Marseilles, where some of his family settled. When he came to the United States is not clear: but during the 1920s he was involved in Assyrian theater productions, especially Arshim Mal Alan, an oft -performed play in many Assyrian communities including Yonkers and Chicago. What his role as a very handsome young man who spoke many languages (Russian and French among them) might have been in the formation of the Federation in 1933 may emerge from examination of the archives of the AANF. But what is clear is that he remained very active on cultural fronts in particular. His known published work is a eulogy to the poet, Adday Alkhas (1897-1959) which was published in GILGAMESH, no. 62 (Tehran). His marriage to Nanajan produced no issue. The reason for honoring Alexander Gabriel at Harvard is that his newspaper and document collection from around the world forms the backbone of the collection of diaspora periodicals from the 1930s-1950s in particular. The nearly complete run of KUKHVA D-MADINKHA (Tiflis) may be the only one remaining in the world. These serials need to undergo a major preservation effort. The paper is brittle and brown and should not be handled in its present condition. Therefore this fund has been initiated to meet this need. As of now, it is NOT established as an endowment simply because an endowment requires a minimum of $25,000. If the endowment amount is not collected in a reasonable period of time, the several thousand dollars now donated will be used up to preserve this collection. Anyone interested in making a donation to the fund, or in providing pertinent missing details of Alexander Gabriel's life, may contact Dr. Eden Naby through Zinda Magazine AGMAPF@zindamagazine.com. (ZNDA: Dohuk) Mr. Youra Mossa, a local leader of the Assyrian Democratic Party in the city of Zakho in North Iraq, says that senior ADM officials have met with an unspecified group of Americans about enlisting Assyrians at the local ADM offices for possible war with Iraq. Local officials say that apart from the C.I.A presence, there has been the American-sponsored effort to recruit guides, civil affairs specialists and translators to work with Western forces should they enter Iraq. "We have registered some names, and we have told them we are ready to register some other names, and to send young people to help America," Mr. Mossa said. "In the case of ousting Saddam Hussein, all the people of Iraq — Kurds, Assyrian, Arabs — will be ready to help." Mr. Mossa said that none of the men his office had signed up had departed for training and that they were awaiting further instructions. American intelligence officials have been working alongside Kurdish officials in recent weeks, and recruiters for an American-sponsored opposition group have been selecting candidates for a program to train scouts and translators that one day may help American forces inside Iraq, according to Kurdish and Western officials. The program, underwritten by the United States Congress as part of Iraq Liberation Act of 1998, would provide training, perhaps in Hungary, for the recruits. American military planners have visited secluded corners of the country to examine potential basing sites for use in a war, according to a Western expert familiar with the activity. No American military forces are based here yet, Kurdish officials say, and recent Turkish and Arabic news reports of sizable military deployments appear unfounded. But teams from the Central Intelligence Agency have been working with the principal political parties in the Kurdish region — the Patriotic Union of Kurdistan in the east, and the Kurdistan Democratic Party in the west — for upward of two months. The C.I.A. teams have become a familiar sight for Kurds, who see them traveling in convoys with armed local guards. A Western expert familiar with the region said the recruiting was coordinated by the Iraq National Congress, an opposition group based in London, and was unrelated to the C.I.A. teams here. "We have to be very careful," a senior official said. "If there are people who want to overthrow Saddam Hussein, we do not want to be too far from them. But we do not want to provoke Saddam Hussein in any way. We know him, and we are responsible for our people, and must be very careful about what we say and do." The sense of uncertainty briefly deepened this week, when Turkish and Arab media reported that 50 military trucks entered Iraq at the border crossing near Zakho, ferrying American troops and equipment into village bases. Some reports said American soldiers were improving airfields in anticipation of war. Turkish military officials and Western diplomats said the reports were false, and Kurdish officials investigated and then dismissed them as baseless. "Until now I have not seen these military trucks," said Akher Shekh Jamal, Zakho's mayor. "If American troops came to Kurdistan, we would see them. We would have witnesses." A Western expert said military activity had been limited to surveys of airfields some weeks ago by American planners near the villages of Bamarni and Harir in northern Iraq. Tours of northern villages appeared to confirm a low level of activity. 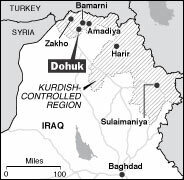 The Turkish Army has operated inside northern Iraq since the late 1990's, under an agreement with the Kurdistan Democratic Party. The deployments are part of the army's counterinsurgency against the Kurdish Workers Party, or P.K.K., which has engaged in a long campaign for Kurdish rights in Turkey. With their armored vehicles, including American-made M60 tanks, Turkish soldiers were visible on Thursday near the airfield in Bamarni and at the mountaintop village of Amadiya, both roughly 15 miles south of the Turkish border. But villagers said the Turks were part of deployments that began in 1997 and that have not recently changed in size or composition. The troops seemed lazily deployed, with few guards. Most of their tanks were idled and under tarps. Fighting positions had clearly been dug long ago. Moreover, the dirt-and-gravel airstrip at Bamarni showed no signs of improvement. It had drainage problems, was littered in places with melon-sized stones, and in sections had shin-high shrubs. "We haven't seen American forces come here," said Nori Fatah Abdullah, of Bamarni, looking down from a hilltop at the Turkish tanks. "We would like it if they came, because they are good people, but they are not here yet." (ZNDA: Baghdad) Saddam Hussein's visage stares down at customers from a wall above shelves of Johnnie Walker whiskey and Russian vodka in Yonan Ibrahim's liquor store. The Saddam calendar, showing the Iraqi president in a Tyrolean-style hat and firing a carbine in the air, doesn't just keep track of the date. It lets shoppers know that this Christian shop owner is a patriot. During the 23 years of Saddam's rule, Ibrahim's fealty has served him and hundreds of thousands of other Iraqi Christians well. But as a U.S.-led war against Iraq looks increasingly likely, Ibrahim believes the Christians' luck might finally be running out, along with their leader's. ''Until now this has been a very good place to be a Christian,'' says Ibrahim, 50, a soft-spoken man with thick spectacles and a natty business suit. As Christmas approaches, Iraq's 1 million Christians feel threatened. Saddam, for most of his career a moderate Muslim, is beginning to appeal to the country's growing number of devout Muslims. A U.S.-led war, the Christians here believe, could pit orthodox Islam against one of the Middle East's largest and oldest Christian communities. With many involved in trade, Iraq's Christians are known for being trustworthy, Ibrahim says. Ibrahim and other Christians interviewed during two weeks in the capital say they believe a U.S.-led war would be seen by many Iraqis as a battle between the Christian and Muslim worlds. ''People will think we are with the Americans,'' he says. Iraqi officials say there is ethnic harmony in the country. Ibrahim believes many Christians hesitate to mention tensions publicly, for fear of conflicting with official thinking on religion. In fact, Christians in this country long known for its Western links and secular culture already have sensed a shift toward Islam. ''Right now, Christians are afraid of the future, of what will happen. Most of the Christians are preparing to leave,'' Ibrahim says. Hundreds of thousands already have. From the moment the 1991 Gulf War (news - web sites) ended, Christians from one of the world's most ancient communities began a stampede to the USA, Canada, Europe and Australia. About 1 million of Iraq's 24 million people are Christian. An estimated 500,000 Christians live in central and southern Iraq. That's 50% fewer than the number that lived in that area a decade ago. About 500,000 live in northern Iraq's three provinces, which comprise a semi-autonomous territory governed by two Kurdish parties. The area, which is under U.N. protection, is patrolled by British and U.S. jets. 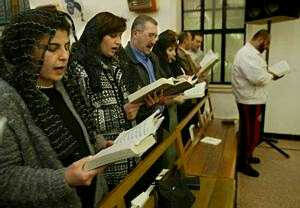 Many of the Christians are Assyrian Catholics, known as Chaldeans here, similar to those in Syria and Lebanon. Their liturgy is in Aramaic, the language Jesus Christ is believed to have spoken. A large number of Christians fled the economic crash caused when the United Nations (news - web sites) imposed economic sanctions after the Gulf War. The sanctions, designed to prevent Iraq from rebuilding its military, blocked all normal imports and exports. Baghdad now has to barter a limited amount of oil for goods. Many Christians were businessmen and traders. They were used to taking vacations in Europe and driving new cars. Unlike many Iraqis, they had the money to emigrate or had relatives in the West to help with visas. Ibrahim's brother lives in Detroit. Others among his 11 siblings have scattered to Canada, Australia and Sweden. The exodus of Christians from Iraq slowed by the mid-1990s. Those able to move already had left. Christians who stayed hoped the situation would improve. Having lived here since Biblical times, they say life in Iraq has been surprisingly secure since the Gulf War. Until now, they've seen few signs of prejudice. But they fear a U.S. military offensive could quickly lead Iraqis to become far more religious amid anti-American sentiment. "I wouldn't choose to live in any other country in the Middle East," says Bob Shaya, 38. He runs a computer parts store in Baghdad's high-tech district with his brother Samir. "This is the best thing about living in Iraq. There is no differentiation between Christian and Muslim." The Shaya brothers have hung a cross next to the racks of software programs, which they copy and sell for $1.50 each. They say hanging a cross in a store in the neighboring Islamic republics of Iran and Saudi Arabia would be a risky move. "I don't even like going outside to nearby countries," says Samir Shaya, 40. Iraq has until now been one of the most secular countries in the region. 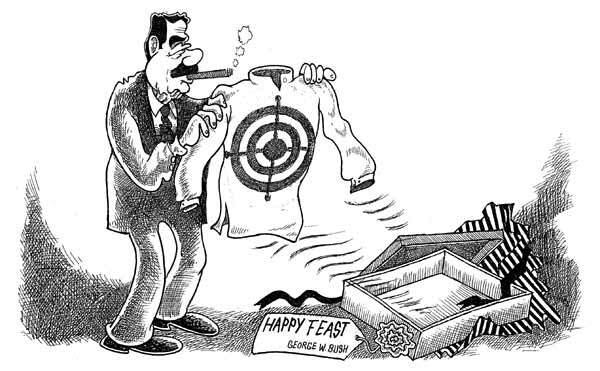 Saddam's Baath Party has a policy of secularism. Tariq Aziz, the deputy prime minister and one of the Iraqi leader's closest aides, is Christian. Christmas is an official holiday, although only Christians take the day off. Baghdad's art galleries openly exhibit nudes. Liquor stores like the one run by Yonan Ibrahim have catered to Christians and moderate Muslims -- among them, government officials buying for government functions -- who don't follow Islam's ban on alcohol. Islamic extremism has been heavily restricted under Saddam, a Sunni Muslim who has always regarded his greatest threat as coming from the religious Shiite majority that has close ties to Iran. Iran and Iraq fought a seven-year war during the 1980s that claimed 1 million lives. The West saw Baghdad as a buffer against the fundamentalist Islamic leadership that removed the pro-Western government of the shah in 1979. Saddam, in turn, saw Iraq's Christians as a counterbalance to any Shiite Muslim fervor. Because of their secular traditions, many Iraqis say they are baffled by the Bush administration's claims that al-Qaeda terrorists might receive help from Iraq. But cracks in Iraq's moderate Islamic culture began surfacing a few years ago. Some Iraqis have turned to religion for relief from the poverty caused by the sanctions. Masterful at sensing the popular mood, Saddam has changed too. He banned alcohol from restaurants and cafes, which long gave Baghdad, a city of 5 million people, a buzzing nightlife. The government-controlled Iraqi television began broadcasting hours of clerics reading the Koran. Last year, a cleric went to the holy Muslim city of Mecca, Saudi Arabia, to perform a pilgrimage on behalf of the Iraqi president. And Saddam has spent tens of millions of dollars building several mammoth mosques in Baghdad. One is the largest in the world outside Mecca. Christians say they sense that the shift toward Islam here has accelerated since the Sept. 11 attacks. They believe some Iraqis identified with the strong anti-American feeling. Others were swept up in a move to more radical Islam in the region. Ibrahim says his business has been pummeled as people have become more observant. "It's unbelievable, my business has gone down more than 50% since Sept. 11," he says. "Sometimes I can't pay the salaries of the workers." Perhaps the greatest shock to Christians came in August. 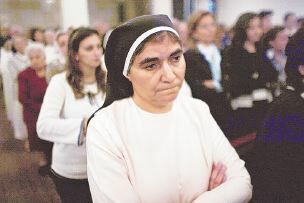 A 71-year-old Assyrian nun, Cecilia Moshi Hanna, was knifed to death and then decapitated in a botched robbery of church relics in Mosul, about 250 miles north of Baghdad. The city, which is known as Nineveh in the Bible, houses priceless Christian relics. Three men were publicly hanged in Mosul's main square for having carried out the murder, according to Ibrahim. "It was a way (for the government) to say that nobody must do this again," he says. Government officials would not confirm the hangings. In an attempt to bring some Christmas cheer, a group of French missionaries traveled to Iraq last week with the bones of St. Theresa of Lisieux, a French saint best known as "the little flower of Jesus." She died from tuberculosis in 1897 at the age of 24. She was canonized for her devotion to teaching spirituality. Iraqis packed churches to see the box of bones lying on the altar. In the Saint George Chaldean Church in New Baghdad, a relatively prosperous part of the city, about 500 people crowded into the pews for a special Mass for the bones last week. In a hall filled with incense smoke, they crossed themselves and chanted ancient Assyrian prayers. For a brief moment, the community was at peace. In his private office, the parish priest admitted the church has been through rough times. "Our parish has 2,500 families. But it is a lot smaller than it was 10 years ago," said Habib al-Nofaley, sitting at his desk in his long black robes. "Many are leaving for economic reasons." Whether they begin leaving for political reasons, too, will depend on what happens during the next critical months. Ibrahim says many Christians believe they will be targeted if a U.S.-led war ousts Saddam, who has until now shielded them from discrimination. Some fear a post-Saddam Iraq could bring a far less tolerant country toward Christians if anti-American feelings run high. "Our government likes us, and they protect us," he says. "But if something happens, we don't know what it will be like. We are really afraid." (ZNDA: Rome) Everything possible should be done to avoid an attack on Iraq, says Archbishop Jean-Louis Tauran, Vatican secretary for relations with states. "The use of arms is not an inevitable fatality; what is more, no provision is made in the United Nations Charter for a preventive war," he contended Monday in an interview with the Italian newspaper La Repubblica. "It is important that Iraq's leaders know how to regulate their political action according to the code of conduct that membership in the U.N. community imposes," the archbishop said. However, he added, "nothing should be decided without the consent of nations and international institutions, from whence derives the irreplaceable role of the U.N."
The archbishop revealed that two months ago he expressed to the U.S. government "the need for dialogue and the appropriateness that it be the international community, as international community, that assumes the responsibility in face of Iraq's eventual default." "A member of the international community cannot say: 'I will do this and you will help me, otherwise you stay home,'" he said. "If it were so, the whole system of international rules would crumble. The risk would spell a jungle. It could happen that tomorrow in a dispute with another state, a country could start saying: 'I am going to put things in order.'" Archbishop Tauran used harsh words when referring to the threats coming from Washington to use the atomic bomb in response to Saddam Hussein: "It would be better not even to echo this hypothesis, as it seems so monstrous to me." The Vatican official said that in his contacts with representatives of European and Arab countries there is a common conviction: "War is not the solution to the problem." The archbishop went on to clarify that it is "necessary to think of the repercussions that [war] would have in the Muslim world. It could unleash a sort of anti-Christian, anti-Western crusade, as some illiterate masses get it all confused." CNN Anchor: Take a casual glance down the streets of Baghdad, and you're liable to see anxiety written on faces everywhere. Today, we caught up with some Christian goers crusading against war. They say they want the world to know that everyday Iraqis would suffer the most. 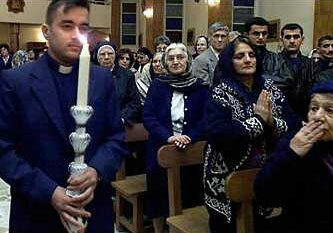 CNN Voice-over: On this evening at St. Joseph's Chaldean Church in central Baghdad, a special kind of service. An appeal to God to prevent war, American and Iraqi Christians together. The Americans, mainly leftist U.S. religious leaders. The Iraqis, mostly senior leaders of the Chaldean Church here. The prayers for peace, not just for Iraq's dwindling Christian minority, they say, but for Iraqis as a people. Simone Campbell, Sister, Exec. Dir. Jericho: Look into the eyes of the people of Iraq. See the Jesuit trained doctor, who can barely contain his despair and the Muslim mother who grieves for her dying son. CNN Voice-over: Roy Bourgeois has long campaigned against U.S. military activities in Latin America. Bourgeois: I would invite my president, President Bush, to come to Iraq and to meet the people here, not -- and to also talk with Saddam Hussein. But first to meet the people, to go into those hospitals we went into, to go to that orphanage, to go into the homes that we went into. Voice-over: Strong emotions among some Iraqis here. "I cry," she says, "because there will be a war and our sons will die and we will die. And we feel comfortable in our country. They come to hurt us and damage our country," she says. (on camera): By organizing a service in a church that members of this American religious group said they were hoping to send a powerful message back home, calling on their fellow citizens to see Iraqis as people like themselves. Voice-over: This peace group, one among more than a dozen that have visited the country since September. Notably absent from the service, any mention of Iraqi President Saddam Hussein and of the efforts by U.N. weapons inspectors to verify Iraq no longer has weapons of mass destruction. CNN Correspondent: Carol, that lady you saw there crying in church, it seems we've actually here to a different phase. There's been a lot of bravado. There is still when you go into the streets of Baghdad. A lot of people will tell you and that might also answer on this end of the story what you were asking General George Harrison there, is the war -- is this war, if it happens, going to be different? Well, a lot of people here say well, hey what can the Americans do to us this year that they didn't do in 1991? So there's a lot of bravado. On the other hand, there is beginning -- we are beginning to feel a lot of anxiety, a lot of people here wondering if they should start taking their children to the countryside if there's a war, if they should stay in town. So there is, I think we're moving into a different phase as far as how people see things. Those peace groups, Carol, by the way, there's dozens of them that have come into the country since roughly September. A lot of them not just American, also Australian, Canadians and a few Europeans -- Carol. CNN Anchor: Yes, lots to think about and deal with in the holiday season. Rym, here in the United States, Christians are preparing for the Christmas holiday just days away with our own rituals and customs. I'm just wondering how the Christians, the Iraqi Christians are preparing for the day? CNN Correspondent: Well, we caught up with a few of them, actually in the streets of Baghdad. They were selling Christmas trees in the streets. And you know, there's not a very big Christian minority. There's only three percent of Iraqis that are Christian, Carol, but they're really preparing for a nice celebration. There's a lot that they can go and fine in shops here in terms of Christmas decorations, for instance, a lot of little Santas here and there. But of course, you know, amid this atmosphere, as I was saying, and a lot them kind of wanting to forget their worries and enjoy Christmas, and then talk about it next year. But also on the other hand, a lot of them knowing that we were an American network, saying why does America do this? The Americans as Christians should know that attacking a people is not a Christian thing to do -- Carol. CNN Anchor: That's fascinating just seeing those pictures of Iraqi Christians shopping for Christmas trees, and to think that, you know, we're so different, but yet we have so much in common with many people there. Thank you very much, Rym Brahimi, reporting live in Baghdad. On behalf of the leadership and members of the Bet-Nahrain Democratic Party, I would like to congratulate Mr. Yonadam Yosip Kanna, Secretary General of the Assyrian Democratic Movement; and Mr. Albert Yalda, for having been selected to represent the Assyrian Delegation at the Iraqi Opposition Groups’ Steering Committee. Let it be very clear that without our support and our encouragement, Mr. Kanna and Mr. Yalda will face a great challenge and at the end they may fail to attain desirable results. Therefore, I am calling on every Assyrian group, political entity, prominent Assyrians and others to stand behind Mr. Kanna and Mr. Yalda and offer them a helping hand and full support. We in the Bet-Nahrain Democratic Party, as was promised to our brothers in the leadership of ADM, will stand firm behind every true and patriotic Assyrian so that they can accomplish their nationalistic mission and fulfill their responsibilities. (ZNDA: Detroit) Returning from Rome, where they attended the ordinations of two new Chaldean Catholic priests, Michigan Bishop Ibrahim N. Ibrahim and about two dozen others were subjected to a thorough inspection and tough questioning by authorities at Detroit Metro Airport. They were the only passengers on their flight, made earlier this fall, to get such treatment when they landed at the airport. Bishop Ibrahim said they were told it was because they were born in Iraq. So far, that is the extent of trouble for local Chaldeans that the bishop is aware of. But the big worry for Chaldean Catholics in the Detroit area -- home to about 100,000 of the approximately 160,000 Chaldeans in the United States -- is that their new country may soon be at war with their homeland. Most still have family there, according to Bishop Ibrahim, head of the Michigan-based Eparchy of St. Thomas the Apostle, which serves Chaldean Catholics in the eastern United States. (ZNDA: Cleveland) Wael Jarbou, a 6-5, 295-pound sophomore, is a backup offensive tackle and a recreation major at Univeristy of Toledo in Ohio who hopes to be a coach and a teacher. When Wael Jarbou talks about bombs, he doesn’t always mean long passes for touchdowns. When he speaks of bullets, he’s not necessarily referring to footballs thrown at high speed. 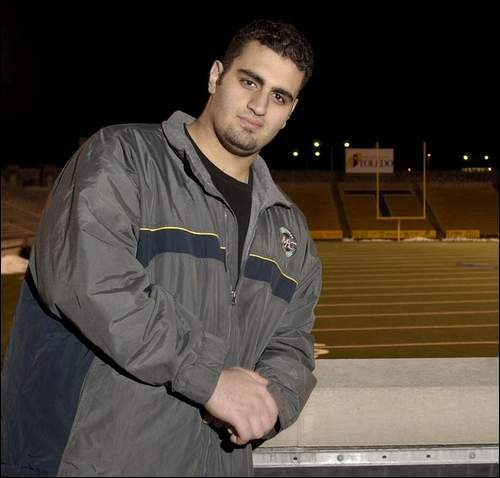 As the University of Toledo offensive lineman prepares to play in the Motor City Bowl on Thursday, his thoughts sometimes race thousands of miles away - around the world - to his native Iraq. Jarbou, whose name is pronounced WHY-el jar-BO, came to the United States at age 10, still has many relatives inside that beseiged nation and he fears for their safety, should the specter of war suddenly turn to reality. "I am very concerned about my aunts and uncles and my cousins over there," Jarbou said. "I love them with all of my heart and I don’t want anything to happen to them. They are innocent people, and I don’t want to see them suffer. They have nothing to do with what is going on." As the United Nations weapons inspectors scour Iraq, the situation is tense and ominous. A misstep on either side could spark conflict and put Jarbou’s relatives in harm’s way - where his immediate family found themselves during the Gulf War in 1991. "I remember there were bombs in the air. It is not the kind of life you want to lead,’’ Jarbou said. "A couple of months before the Gulf War started, people were robbing houses, killing each other - people were basically going insane. We just had to get out of there." Jarbou and his parents and siblings, members of the Chaldean Catholic sect that has lived in that part of the world since biblical times, fled their residence in Baghdad. They found sanctuary in a city five hours to the north that was the home of Jarbou’s ancestors. "We wanted to get away from the bombings," Jarbou said. "Most of the planes were over Baghdad and we were close to where the bombs were hitting, so my parents wanted to get us away from that. We found shelter there in the north." Shortly after the war ended, Jarbou, his parents, and two sisters were granted visas to emigrate to the United States. They had applied for the visas 10 years earlier. His family settled in the Detroit suburb of Southfield, Mich., where Jarbou’s uncle lived in the large Chaldean community that exists there. An older brother had been in the States for some time, and the rest of his immediate family followed later. "We came here to America by choice - we did not want to live that way," Jarbou said. "There are many great people in Iraq, people who are concerned about having a safe place to live and feeding their families. They can’t control the situation with the government, but they will suffer if war returns. I don’t think that’s the way life should be." Jarbou, whose father owned three bars in Baghdad, said his family was not mistreated by the Muslim majority. He said people of different religions were tolerant of one another in Iraq. "I am Chaldean, but we just kind of blended in with the Muslims and lived our lives," Jarbou said. "There are many types of religions there, and we just made friends with everyone. You can live your life, but it is difficult to speak out. You are limited to what you can say or it will be a bad situation for you, and for your family." When Jarbou arrived in America in 1992, he experienced culture shock and struggled with the language barrier. "It was very difficult then," he said. "I spoke Arabic a little, and knew how to write it and read it. But at the same time I wanted to learn English, and then I forgot about Arabic. I was kind of like in a hole between the two. I didn’t understand both languages." With some tutoring he conquered English, and in ninth grade found himself ready to take on one of the unique aspects of American culture - football. To that point, soccer was the only sport Jarbou had played. "I didn’t know much about football, but a friend said I had the body for it and convinced me to try out," he said. "I liked it, and kind of made it my career." The college recruiters came in his senior year, and Toledo landed the 6-5, 295-pounder. Jarbou, a sophomore, is a backup offensive tackle and a recreation major who hopes to be a coach and a teacher. "Wael is an outstanding kid who gives you the feeling that he really appreciates the scholarship he has," UT head coach Tom Amstutz said. "He seems to love everything about the college football experience. He is really living out a dream." Jarbou said he expects to have as many as two dozen family members in the stands at Ford Field, the new downtown Detroit home of the NFL’s Lions, when the Rockets take on Boston College. "This bowl game will be a moment of joy in his life at a time when I’m sure his family is concerned about what is going on halfway around the world," Amstutz said. "It will be thrilling for them to see me down on the field in that new stadium," Jarbou said. "It will bring smiles to their faces, and it’s nice to have a good thing like that happen for them at Christmas. "We’re excited about the bowl game, and at the same time we’re all very concerned about what could happen to our loved ones in Iraq. But we realize, all we can do now is pray for them." (ZNDA: Detroit) The Rev. Emanuel Shaleta doesn't need census data to tell him metro Detroit's Chaldean population is growing. Seeing almost 1,000 people -- 90 percent of whom are from Macomb County -- pack each of his four Sunday masses at St. Joseph Chaldean Church in Troy is a good indicator, Shaleta said. "When you see people standing in the church on regular Sundays, you have a problem," he said. To deal with overcrowding at the church, on Big Beaver just west of Dequindre, officials have developed plans for a new church in Shelby Township -- the first Chaldean church in Macomb County. St. George Chaldean Church will sit on 9 acres along Dequindre, north of Hall Road. Chaldean leaders rely on parish membership at their five Detroit-area churches to estimate that at least 100,000 Chaldean Americans live in the tri-county area. The U.S. Census does not distinguish Chaldeans or Arab Americans as a separate ethnic group. In the 1990s, Chaldeans moved to West Bloomfield and Southfield. In the last few years, Chaldeans have started moving to Macomb County -- specifically Sterling Heights, Warren and Shelby Township. Church officials estimate 4,200 Chaldean households are in those three cities alone. Construction on the $5-million project, which includes a pastor's residence and parking lot, will start next year and possibly be completed in 2004. Money will come from donations and loans. A pastor will be appointed when the church is expected to open, Shaleta said. A Chaldean church in Macomb County is a milestone for the many Chaldeans who started moving to the east side 15 years ago, said Nick Najjar, St. Joseph parish council president and Sterling Heights resident. He said Sterling Heights has become so popular that 23 families related to him live between Dequindre, Mound, 14 Mile and 20 Mile. Najjar, a real estate agent, estimates there are 200 Chaldean-owned businesses in Sterling Heights. "I joke that it's Chaldean Heights and I'm the mayor," he said recently in his Century 21 office in Troy. Photographs of him with politicians such as Jesse Jackson, Gov.-elect Jennifer Granholm, U.S. Sens. Hillary Clinton and Debbie Stabenow, Warren Mayor Mark Steenbergh and Macomb County Prosecutor Carl Marlinga line his wall. Najjar has worked as a member of 14 civic organizations, including the Sterling Heights Ethnic Advisory Committee, for which he volunteered to translate the city's resident guidebook into Arabic. Last week, the city printed about 1,000 copies of the book, which outlines things such as city codes and garbage pickup schedules. Code enforcement officers will distribute the books. "When we first came, we didn't have someone to hold our hand and go to the Secretary of State to get a driver's license," he said. "Today the newcomers don't have a problem." Years ago, he says, a group of Chaldean men playing cards in a Sterling Heights coffee shop were hassled by police who thought they were gambling.Najjar and others have tried to work with local police departments to promote better understanding of the culture. Najjar didn't speak English when he came to the United States in 1983 and immediately started at a Detroit party store,where he earned $80 a week working from 9 a.m. to 2 a.m. He jokes that all Chaldean immigrants must do their time working in a party store, gas station or motel, which are common family businesses for Chaldeans. "When you have the whole family working, then you can turn a profit because you don't have a lot of overhead," Najjar said. Michigan has five Chaldean churches affiliated with the Chaldean Archdiocese. They're in Detroit, Oak Park, Southfield, Troy and West Bloomfield. The next two closest churches are in Chicago, Shaleta said. Chaldeans will sometimes drive an hour to go to church because faith is so central to the culture, said Margaret Saroki-Shamoun, a Chaldean Archdiocese spokeswoman. "We were a minority in our native country," Saroki-Shamoun said. "So we hung very closely to the church. The church meant everything to us. That's why when they come here, they want to be part of the church." Like many other Chaldean Americans, Saroki-Shamoun's grandfather moved his family fromTelkaif, Iraq, to Highland Park in the 1960s with hopes of a good-paying auto factory job. The family then moved with many others to the 7 Mile and Woodward area, then to Southfield and to West Bloomfield. Now many Chaldeans are arriving in Macomb County, where second- and third-generation Chaldeans are starting medical practices and law firms. "Nowhere in the world can you find an opportunity like in America," Najjar said. Anadoul Khomari, 59, of Turlock died of natural causes Sunday at Stanford Medical Center, Palo Alto (June 27, 1943 - Dec. 15, 2002)..
Mr. Khomari was a native of Iran. He had lived in Turlock since 1980. He was a maintenance person and had worked at Nordic Saw and Tool in Turlock. He was a member of Assyrian Church of the East, Mar Addai Parish, and the Assyrian American Civic Club. He is survived by his wife, Freda Khomari of Turlock; children, Jeff Khomari, Michael Khomari and Angela Khomari, all of Turlock; brothers, Jura Khomari of Turlock, and John Khomari and Joseph Khomari, both of Iran. A funeral was held at 10 a.m. last Thursday at Assyrian Church of the East, Mar Addai Parish. Burial at Turlock Memorial Park. Allen Mortuary in charge of arrangements. Mr. Khoshabeh was a native of Urmia, Iran. He lived in Turlock 20 years. He was a truck driver for 50 years. He was a member of Assyrian Church of the East, Mar Addai Parish. He is survived by his wife, Kheneh Polis of Turlock; brother, Misheal Khoshabeh of Austria; and sister, Youlieh Khoshabeh of Iran. A funeral was held at the Assyrian Church of the East, Mar Addai Parish. Burial at Turlock Memorial Park. Whitehurst, Norton & Dias Chapel in charge of arrangements. Julia Alawerdy Yohana, 92, of Turlock died of natural causes Thursday at Emanuel Medical Center (June 2, 1910 - Dec. 12, 2002). Mrs. Yohana was a native of Urmia, Iran. She lived in Turlock 24 years. She was a homemaker. She was a member of St. John's Assyrian Presbyterian Church, Turlock Senior Citizens and American Assyrian Civic Club. She is survived by her daughters, Sarah Girard and Diane Moran, both of Florida, and Florence Jacobs of Turlock; sister, Dolores Baba of Chicago; and two grandchildren and one great-grandchild. A memorial service was held at 11 a.m. last Thursday at St. John's Assyrian Presbyterian Church. Private burial. Whitehurst, Norton & Dias Chapel in charge of arrangements. Remembrances may be made to St. John's Assyrian Presbyterian Church, 450 S. Palm Ave., Turlock 95380. 221 Russell Senate office Bldg. Your visit to Northern Iraq has been long overdue. It offered an opportunity for you and Senator Hagel to see first hand the situation in Northern Iraq. I listen to your interview with Al-Jazeera TV station and some of the US news outlets about the situation of the Kurdish people. I was very displeased when I did not hear anything about the Assyrian people that constitute more than 30% of the total population of Northern Iraq. Assyrian people of Northern Iraq are of Several Rites mainly of Chaldean (Eastern Catholic), like myself and Nestorian (East Orthodox) that can trace their ancestry in the area to Assyrian and other early Semitic tribes that settled in the region around 3000 B.C. We speak modern Syriac, which is a combination of Aramaic and Acadian language and is the language that Jesus spoke. Our contribution to human culture and civilization need not to be mentioned. Assyrian People deserve the same attention that is given to the Kurds. They have suffered from years of oppression at the hands of the Central government in Baghdad and at times at the hands of their Kurdish neighbors. They need not to be forgotten in any political settlement that will follow a post Saddam government. They deserve more of our sympathy and attention because they share the message and are members of the body of the Christ. If I can be of further help in providing any historic data about the subject, I can be reached at 202-782-7978 or at my cell phone at 303-980-0209. Thank you and have a nice day. On behalf of all Assyrians, I would like to express our gratitude to Mr. Lewis for his excellent article on Assyrians of Iraq [Wall Street Journal]. He has portrayed their history in Iraq very accurately and with feelings. We Assyrians have been oppressed, massacred, and mistreated for almost 2,000 years and still continue to exist. Nether Saddam nor other Kurdish leaders can wipe us out of existence. Without Assyrians, Iraq does not deserve to survive. We hope that other fellow Americans and the United States government would keep in mind the interests of this small minority who are the original inhabitants of Iraq. We Assyrians have contributed a great deal towards the human civilization and especially to the advancement of Arabs. We have an important role to play to make Iraq a democratic country. What we are asking the world in general and the future Iraqi government is to allow us the opportunity to make our contributions. Just thought you might be interested to know about this message that I just sent to Miss Evelyn Benjamin in Tehran about the contributions she's making to our dear Dr. Ashour Moradkhan's ATRA Project in the North of Iraq. A very merry Christmas and a hopefully outstanding New year, not only to you, the crew, for your excellent presentations, but to all Assyrians around the four corners of the earth. Khaya Atoor l'alam.... Under one name only... Assyrians. I would like to contribute and comment on the article written by Mr. Saad Marouf. Is another attempt to sabotage the Assyrian efforts? I am really surprised to read the article written by the Chairman of Chaldean Federation of America” regarding the success that the Assyrian Democratic Movement (Zawaa) has achieved and for getting the recognition from the American government as one of the Iraqi opposition parties. What struck me is the attempt by the writer to create more division in our Assyrian nation, by insisting to call it Chaldean/Assyrian” as if Assyrian is a group descended from “chaldean”. The writer knew that the success Zawaa has reached might bring fruitful results in future of Iraqi government. Therefore he took the punt to find out how more Assyrians could be “fooled” and why not as long as they had bitterly accepted being called Assyrians/…/… How did that help the writer and his supporters in USA other than Assyrians collectively losing everything simply by reducing the total number living in that country during the latest census. Everyone knows the benefit of groups lobbying and asking for some rights and gains from governments. Hence the writer supported by “some” that are profiteering from dividing Assyrians for (personal and hidden purposes) had tried his best simply by asking to add a name and attach it to Assyrians even if that name was imposed on Assyrians wrongfully and unjustly. Here I mean (Chaldean) as it does not represent any group at all. Due to many reasons and the finger pointing at many fragments in our Assyrian society such as the writers, singers, authors, politicians…etc simply by linking Assyrians and “Chaldeans” even though I believe that Chaldeans no more exist and a lot of the readers would agree that Chaldeans had lived in the southern part of Mesopotamia (Iraq). Due to the raids and attacks over the years such nation had dispersed, scattered and disappeared. And we cannot find any living evidence that proves such nation does exist. So why mention it in our songs, writings, speeches…etc. In the past they were an offshoot of Assyrians, but what benefit we as Assyrians are gaining from repeating such a name when nothing indicates that people in “Chaldo” do exist today? And it is clear that we need to review the way we praise Assyria and Assyrians in future discussions to prevent such people like the writer from using the word Chaldean wrongfully and more, use it against Assyrians. His Holiness the Patriarch Rafael Be Dawid had admitted that followers of the Catholic church (Chaldean church) are Assyrians and his grand father was a deacon in the Church of the East. His holiness should be applauded for such comments as he is trying to educate the majority of followers that we are all Assyrians even though we have different church affiliations. But unfortunately he was not encouraged to continue in his path simply because a lot among his congregations would lose what they were cashing in which is the division of our nation. I would like to ask the writer since when such patriotic feeling towards the so called “Chaldeans” became an issue. Is it again just because Assyrians took the initiative (as they are always in all fields of life?) so the writer and many others decided to react and try to score some cheap points again by trying to imitate the Assyrians. I would like to remind the writer and others, that Assyrians had sacrificed lives of valuable youth (and still are doing it through Zawaa, and other parties in northern Iraq), and had been arrested, tortured, executed, stripped from their livelihood simply because the refused to be anything else but Assyrians. They believed that life without principles is worth nothing, and it is clear to everyone that Assyrians were and still are discriminated against in Iraq simply because they refused to follow the government line. They can easily be distinguished by names as they are Ashour, Sargon , Shamiram, Nineveh…etc while it is easy to get confused to know the writer’s origin as his name is simply an Arab’s (Saad Marouf). And this tells everyone that people carrying the writer’s ideas and opinions were enjoying their lives in Iraq as they enjoyed being amalgamated with the Arabs starting with carrying Arab names, and behaving like them specially in their uniform as they enjoyed wearing (dishdasha), and mixing with Arabs. Everyone also knows that such people as the writer and his supporters came from cities and villages surrounding Nineveh. So I am wondering how come they are so confused to call themselves in Iraq, as Arabs, and here trying to create another name and resisting to admit the reality that we are all Assyrians regardless of our religious affiliations? Finally what contributions those people wrongly calling themselves “Chaldeans” have achieved in the years of living in western countries other than good and strong relation with the Iraqi regime. They enjoyed visiting Iraq, as many delegations were visiting Iraq including the “Iraqi Sport Club” in Detroit. Everyone knows how Iraqi regime enjoys creating divisions and problems among opposition groups and Assyrians are not exempted from this. As the reader can tell in the article written by the Mr. Saad Marouf (Zinda Magazine Issue: December 9, 2002) he does not admit that Assyrian is the name of this nation and what ever names… come after the slash, but had changed it as …./Assyrian which tells us that there is no intention of compromise but the opposite, trying to change the facts. But why? And for what reason? That I do not know. Merry Christmas and a happy new year to all the staff of Zinda Magazine and thank you for the great work you have been doing these many years. Dear Editor and all Staff: Wishing you a joyous Christmas and many blessings throughout. With the aim of attracting support from Muslim states, Saddam Hussein has ought to portray himself as a defender of Islam against an imperialist West. To that end, he has abandoned long-standing secularist policies and stoked anti-Christian sentiment within Iraq --not to mention his support for Hamas in its war on Israel. As a showdown looms with the U.S., no group within Iraq has been more negatively affected than the Assyrians, Iraq’s indigenous Christians, who are likely to be pivotal in any long-term U.S. plan for the region. Indeed they might make the differences between stability and simmering civil war in northern areas which are too broadly (and ignorantly) considered exclusively Kurdish. The Assyrian Christians, a non-Arab, Semitic people with a 5,000-year presence in northern Iraq, constitute some 5% to 10% of the Iraqi population. Despite constant threats from Muslim neighbors, they have kept their ethnic and linguistic identity alive and maintain a flourishing diaspora in Australia, Europe and North America. During the British Mandate that lasted from 1920 to 1932, the British employed the Assyrians as protectors of the Crown’s interests in Iraq, only to abandon them shamefully when a newly independent Iraq entered the League of Nations in 1932. A year later, using the Assyrians’ prior alliance with the British as a pretext for violence, the new Iraqi government launched an anti-Christian jihad in which scores of Assyrian civilians were murdered and their villages set on fire. Arab nationalists have continued to draw upon this Assyrian-British connection as evidence that Assyrians are agents of the Christian West. Saddam's Baath Party, which came to power in 1968 as an Arab nationalist movement with ideological roots in European fascism, officially denies the existence of the Assyrians as a separate ethnic group and has implemented numerous policies in order to both ethnically cleanse the Assyrians from Iraq and to erase their identity as a distinct people. Iraqi officials, seeking to physically obliterate Assyrian civilization, have been involved in the looting and smuggling of priceless Assyrian artifacts. Speaking Assyrian in public carries great risks. The recent savage murder and beheading of a nun in Baghdad indicates the lengths to which the regime will go in order to terrify its Assyrian population. The regime has likewise manipulated the U.N. sanctions to further their persecution of Assyrians. In order to participate in the oil-for-food program, Assyrians (like their neighbors, the Turkmens) must deny their identity on all government documents and register as either Arabs or Kurds, the two officially recognized Iraqi ethnic groups. Should they refuse, they face the prospect of starvation, or banishment to the Kurdish-controlled region in the northeast, where they face educational discrimination and general persecution at the hands of predominantly Muslim neighbors who sometimes derogatorily refer to Assyrians as "Christian Kurds." Indeed, Assyrians have bitterly accused Kurdish authorities, particularly the Kurdish Democratic Party, of deliberately working to undermine their rights in northern Iraq. Given that the majority of Iraqi-Americans are Assyrians and not Arabs, Assyrian-American organizations should be given ample voice in shaping certain aspects of American foreign policy for a post-Saddam Iraq. It is thus to his credit that President Bush, in his Oct. 7 speech to the U.N. General Assembly, formally addressed Iraq’s repression of its Assyrians. The Bush administration has taken specific steps to ensure that Assyrian rights be respected. Partially in response to pressure from Congressman Henry Hyde’s advocacy on behalf of Assyrian-Americans, the State Department has welcomed Assyrian participation in planning for an Iraq free from Saddam’s grasp. However, despite the fact that several Assyrian representatives are involved with Foggy Bottom’s "Future of Iraq Project," the predominantly Muslim Iraqi opposition groups have been generally reluctant to partner with the Christian Assyrians. This has not stopped Assyrian-American organizations from launching an extensive advocacy campaign on behalf of their brethren in Iraq. This has involved countering Kurdish attempts to declare much of the northern region their own, including the oil-rich towns of Kirkuk and Mosul, a land-grab which they have tried to sweeten by offering the Assyrians and Turkmens representation at a Kurdish parliament-to-be. Understandably, the Assyrians have rejected the offer. But not many Americans are aware of these behind-the-scenes tensions. The recently formed Assyrian-American League, which calls for a secular and democratic Iraq, has hired former Illinois Congressman Michael Flanagan to be their lobbyist in Washington. Congressmen and policy planners seriously interested in the democratization of the region should reach out and work with this organization, as well as with other credible Assyrian organizations. At the very least, officials tasked with planning for both the coming war and its aftermath should seek out Assyrian-Americans’ invaluable knowledge of Iraqi society. Assyrian-Americans have, likewise, courageously voiced their willingness to work with their Jewish compatriots to shape a democratic Middle East. Given that both Saddam and Persian Gulf-based Islamists might incite mass violence against the Assyrians in the advent of an American-led attack on Iraq, the U.S. has a particular responsibility to prevent a repetition of the aforementioned 1933 massacres, in which the British stood idly by as their former allies were ruthlessly slaughtered. Indeed, the potential for massive ethnic violence in northern Iraq between Arabs, Assyrians, Kurds, and Turkmen remains high, particularly if the Baath regime were to fall quickly. The Bush administration must, therefore, remain cautious in endorsing an officially recognized Kurdish autonomous region for a federal Iraqi state without first providing legal safeguards for Assyrians, as well as for all other ethnic groups in the area. The dearth of reliable census material and the results of decades of forcible assimilation in the region combine to make it extremely difficult to evaluate competing land claims for oil-rich territories in northern Iraq. Nevertheless, under the auspices of the 1932 Declaration of the Kingdom of Iraq, Assyrians arguably have viable land claims in the oil-rich Mosul Vilayet, a former Ottoman territory that the Council of the League of Nations annexed to Iraq in 1925. Given the fact that Assyrians in northern Iraq have been constant victims of ethnic cleansing, the international community should take their legal claims for land rights and due compensation as seriously as the competing Kurdish and Turkmen claims on Kirkuk, another oil-rich city whose dominion is hotly contested, and which could be witness to ethnic strife in the months and years ahead. For reasons both moral and tactical, the Bush administration and Congress should continue, and heighten, its concern for the Assyrians in northern Iraq. America now has a golden opportunity to safeguard the rights of one of the Near East’s most persecuted peoples, and to create a new reality that could redress various 20th-century injustices that have been perpetrated against them. - Prof. Sidney H. Griffith (CUA): "Christianity in Edessa and the Syriac-Speaking World: Mani, Bar Daysan, and Ephraem; the Struggle for Allegiance on the Aramean Frontier"
- Prof. Paul-Hubert Poirier (Laval), "Faith and Persuasion in the Book of the Laws of Countries: A Note on Bardaisanian Epistemology"
- Dr. Robert A. Kitchen (Regina): "Becoming Perfect:The Maturing of Asceticism in the Syriac Book of Steps"
- Prof. Amir Harrak (Toronto): "Trade Routes and the Christianization of the Near East"
- Marica Cassis (Toronto): "Kokhe, Cradle of the Church of the East: An Archaeological and Comparative Study"
- Group of Scholars: "Syriac in International Research"
Join the CSSS and you will receive the Journal as part of your membership in addition to the Society's yearly programmes of public lectures and symposia. Membership: $35.00 (in US$ outside Canada). Members who paid their dues last year and who could not attend CSSS Symposium II last November: the Journal was just mailed to your address. We wish to inform you that we have put some of our radio files on-line at your disposal to which you can listen or download. These files include biographies, reports, conferences, etc. You can access them at any time. Moreover, we will add audio and video files in the section titled “Nos Archives” as we go along. Our archives will be updated daily, so do not hesitate to consult them regularly. From January 2003, all our radio programs will be archived in this section so that you can access them at any time. 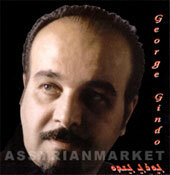 "George Gindo 2003" is the newest album released on December 15 by the Assyrian vocalist, George Gindo. 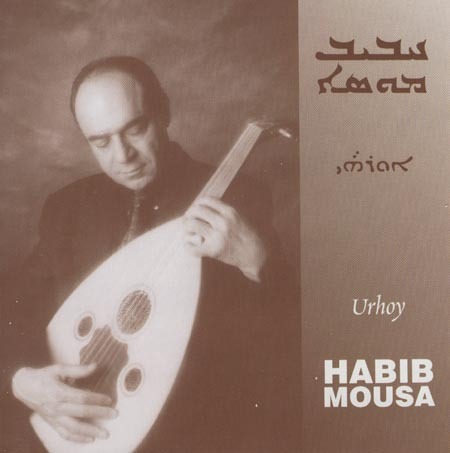 To celebrate Christmas and the holidays with us, AssyrianMarket.com is offering this CD to you for only $8.99!! Hurry up and take advantage of this offer. It will only be here through December 31st. It is stated that to learn how to compromise is a gift. The question to wonder about here should be: do we apply this gift in every single aspect of life or do we have a limit that we do not cross in certain specific cases. It goes without saying that it is admirable to play the compromise game since it narrows the gap between sides in disagreements and brings them closer together. But, one has to admit that, and after all is said, there are certain things in life that are not subject for compromises. Truth, on the other hand, is stated to be the quality of a person of God and a person of principles. I wonder how far can a person go in this process of compromise without breaching this divine attribute called truth? Can we be free while living a lie? Is it acceptable to lie in order to manifest a compromise? And if we, today, answer yes to lie, how far would we stretch this lie tomorrow? If we cannot guard the truth that has been entrusted upon us by our forefathers, how do we expect our children to guard this holy name “Assyrian”? We could indulge in compromises in many issues of life, but the Assyrian national name, in my opinion, must not be the grounds for ANY compromises. We need to stop here and draw a line once and for all. I respect the titles Chaldeans and Syriacs for the specific truthful meaning they hold as terms for one of our sects and for our language. But, and as Patriarch Mar Raphael I BiDawid stated in his interview with the LBCI in March 2000, we need to stop mixing religion with ethnicity. We must begin to learn how to defend “The Assyrian” because “Assyrian” is the truth. We must fear not the truth, for the truth endures and prevails, as our Lord said. Few years back, a renegade priest and few individuals began their plans to hijack the Assyrian national name. At the time, only few people stood to reject what was going on because, and as my writings indicated at the time, we envisioned the conspiracy behind it. Those separatists tricked many Assyrians. We knew then that their intentions were solely to dilute and destroy the Assyrian name by adopting a mediocre shameful slashed solution under the pretext of a very shiny word called unity! After three years of that “unity”, we live today to witness the establishment of a new Chaldean history, Chaldean language, Chaldean flag, Chaldean Aid Society, Chaldean News Agency, Chaldean Political Organization, and the Chaldean Newspaper “The Chaldean Nation”. After all this, the December 11, 2002, Statement of the Chaldean Federation came out in response to the request of support from two separatists from north of Iraq, Abd al-Ahad Afram Sawa, Yousif Al-Qas Hanna (Abu Hikmat). The letter goes on to praise the ADM through many aspects BUT recommended that the ADM change its name to “Assyrian Chaldean Democratic Movement”! Is the letter another political maneuver to benumb the naïve Assyrians? We do not know really. Such things are not translated through declarations rather actions, and ONLY time will tell. 1. It is rumored that a certain bishop has sent a letter to the President asking for a separate category for the Chaldeans. 2. News has it that an envoy of few individuals from Detroit was summoned to the State Department for the same purpose. 3. We know well by now that the Kurdish Democratic Party (KDP) is trying hard to undermine the Assyrian national movement through its support for Mr. Abd al-Ahad and his small group in north of Iraq. It is obvious that this man (member in the KDP and presumably a president of a Chaldean political organization that is yet to be seen in real political life) has no interest in the welfare of our people but to destroy all what the Assyrian Democratic Movement had built in the last 10 years and the Assyrian national movement in general in the last 100 years. 4. The KDP entered the December 14, 2002, Iraqi Opposition Group meeting in London flanked by two of their Chaldean agents, Abd al-Ahad Afram, the president of the Chaldean Party, and Yousif Al-Qas Hanna (Abu Hikmat), the president of the Labor Party for Independent Kurdistan. The Kurds even forced Mr. Afram to speak. In his address, Mr. Afram did not want to lose any support that he might have in north of Iraq, therefore, he emphasized the same broken record “we are one nation” BUT demanded that we be called Assyrians AND Chaldeans! Why Assyrians AND Chaldeans? What does AND mean? It means that Assyrians and Chaldeans are two separate things, simple. When we say Arabs and Kurds, the “and” here does not unite the Arabs and Kurds, unless Mr. Afram understands the English language better than everybody else, and in that case we wish if he explained to us how we could be “ONE NATION” but as Assyrians AND Chaldeans! Some people go around and try to be politicians. Personally, I was never a politician; I care for the historical truth because through truth I gain my strength. There is always the exception in history; there is always that mistake that someone had made; there is always that unusual that a notable had proclaimed, but we cannot base our knowledge on the exception and the unusual. In 1932, it was Malik Khoshaba, a bishop and few heartless and soulless Assyrians who undermined the Assyrian national case in the League of Nations; today it is a renegade bishop, Abd al-Ahad Afram, Abu Hikmat, and few others running lose between Detroit and San Diego, who are tempting to undermine the Assyrians in the new Iraq. This is not the time to sweep things under the rug; this is the time when we must know clearly without doubts who is Assyrian and who is not, there is NO MIDDLE WAY about it. What does the truth tell us? The truth declares that we are not a nation called “one people” or “our people”; we are not a nation called “Assyrian/Chaldean/Syriac” nation; we are not “Assyrian-Chaldean” nation; and we are not “ChaldoAssyrians”. The above are not uniting formulas; they rather divide as they legitimize the historical sin. How could we look in our children’s eyes and claim that we are passing the Assyrian legacy to them when we are tempting to corrupt it today? Seek the truth my fellow Assyrians for behind it is our strength. The Assyrian is not for sale; for the Assyrian is priceless. The Assyrian is not about quantity; for the Assyrian is that truth in the hearts of those few proud men and women. A faith in 4000 years of truth is what the Assyrians need, seek it, trust it, and defend it because through it is the Assyrians’ perseverance. (ZNDA: Los Angeles) When La Chef de Contintental Cuisine and Pizza opened in Downey in 1993, the word spread fast. Even though the title was silly, and bad French to boot, the food was as terrific as it was cheap, thanks to owner and chef Zaya Mirzaie. Soon the doorway was crowded with people lining up to get to one of the few tables. As the months went by, the name was corrected to Le Chef, the menu and prices got a little more upscale and the restaurant got more recognition as a place for fine dining. Finally, Mirzaie outgrew the small quarters and moved to a brand new building in the El Paseo shopping center in South Gate last July. Now he has beautiful surroundings to match his beautiful food. The prices are a lot higher, too, because it took $1.5 million to get the place ready, yet they're still a bargain when you consider what you'd pay for this quality of food on the West Side of Los Angeles. The menu has many different influences, but you can tell Mirzaie got started in French cooking by such items as escargot, frog legs and stuffed rabbit. Mirzaie said the frog legs are among the most popular items on the menu, simply because there aren't many restaurants left that offer them and the frog enthusiast grapevine is pretty efficient. Sauteed mushrooms. These are large button mushrooms, sauteed in whole butter with fresh garlic, salt and pepper. Fried calamari and onions. Rings are sliced and marinated in buttermilk a day or two, then breaded with a flour that is spiced with oregano, paprika, curry powder, cumin, garlic powder, salt, pepper, chili powder and cayenne pepper. The rings and onions are deep-fried in corn oil. The flavor was on the hot and peppery side but tasty, but I thought the rings were a bit rubbery. For $9, I would have preferred that the appetizer had pieces of calamari steak. Both homemade dipping sauces were excellent. The cocktail sauce was made with ketchup, chili sauce, horseradish and lemon, and the tartar sauce was a revelation because it wasn't sweet. Containing no pickle relish, the tartar sauce was a blend of mayonnaise, capers, chives, shallots, mustard seeds and lemon. Caesar salad. There are no anchovies in this version, although by request you can have some placed on top. The dressing is fresh garlic, parmesan, salt, pepper, parsley, olive oil, corn oil, whole eggs, lemon juice and vinegar. The croutons are made at the restaurant from pieces of brioche put into a mixture of garlic and olive oil and baked. Romaine is tossed with the dressing, croutons and fresh parmesan. House salad. It's a mix of organic greens and hearts of romaine. I tasted two of the homemade dressings, both delicious. The roquefort was made of roquefort cheese, mayonnaise, chives, shallots, mustard seeds, vinegar, buttermilk and little whipping cream. The raspberry vinaigrette contained fresh ground raspberries, balsamic vinegar, extra virgin olive oil, salt and pepper. Chicken madeira. Fresh chicken breast is salted and peppered and put into a hot pan with margarine, shallots and mushrooms. Then madeira wine is added, plus some duck stock, tomato paste and pearl onions. Mirzaie makes his own duck stock from duck bones that are sauteed and then braised with water, celery, onions and thyme. Half duck. This consists of a leg and breast that are salted and peppered and sauteed in margarine. Pinot noir and some duck stock that's been reduced with raisins are added, and this slightly sweet mixture becomes the sauce. I liked the flavor as a good alternative to the classic orange sauce, but even though I ordered the duck crisp, it wasn't. Making a duck that has a crisp skin and juicy meat is a challenge Le Chef still needs to work on. Chilean sea bass. Fresh fish is sauteed in clarified butter with salt, pepper and granulted garlic. Separately chardonnay wine, capers and a garlic butter sauce are cooked together. When the bas is done, the wine sauce tops it, along with capers. Roasted potatoes. Russet potatoes are boiled and cut into squares, then deep-fried quickly in corn oil to get them brown. Then they are sauteed with the oil that sticks to them in a pan with garlic, oregano, cumin, chili powder, curry powder, paprika, salt, pepper and cayenne pepper. Fettucine. This side dish of pasta can also be fusilli or other choices. There are also two choices of sauce. The Alfredo sauce is made with heavy cream, nutmeg, garlic, olive oil and three cheeses: cheddar, jack and parmesan. The pomodoro sauce is made from plum tomatoes that have been blanched and skinned, then diced and sauteed in olive oil with garlic, salt, pepper, fressh oregano and fresh thyme. Chocolate souffle. Mirzaie says he doesn't use egg yolk in his souffles ''because of the cholesterol.'' He melts milk chocolate in a double boiler and adds butter to get a thick syrup and also puts in vanilla extract. Then he whips up egg whites and combines them with the chocolate mixture. They are put into souffle dishes and baked, then served with whipped cream. Apple tart tatin. Spelling is not Mirzaie's strong suit (cooking is! ), so this French specialty was listed on the menu as Apple Tart-Tan. There was nothing wrong with the dish, however. It was made with pieces of green apple caramelized with butter and sugar, then put on a baking plate and covered with pastry dough. After it's baked, it's flipped over so the apples are on top. Service was smooth, friendly and efficient. The chef made a small mistake on one order, and it was quickly corrected. Dinner entrees are mostly $16 to $23, and even though the menu doesn't say so, that includes soup or salad, along with vegetables and a starch. Where you jack up the bill is in the appetizers, $6 to $11, and desserts, mostly $6.25. But the quality is high and the surroundings are pretty, so it's a pleasure to pay these prices. The reason Mirzaie doesn't spell French well is because he was born in Athens. His family background is Aramaic-Babylonian-Assyrian, originally from what is now Iraq. But his grandparents lived in Russia before moving to Athens in 1937. His parents moved from Athens to Germany, and he grew up in Wiesbaden. He was 7 when his mother put him on a chair by the stove and he started helping her cook. When he was 21, he moved to France to study electronics at the Sorbonne, but because of his interest in cooking, he also took classes at Le Cordon Bleu cooking school and worked at the restaurant Laurent on the Champs Elysses. In 1979, he moved to Sacramento to contue his studies and worked at local steakhouses. His father's sudden death at 48 shook him up, and he dropped out of school and came to Los Angeles. "I couldn" t concentrate on my education anymore, and I was in love with cooking anyway,'' he said. In Los Angeles, he worked with and learned from famous chefs at L'Escoffier at the Beverly Hilton Hotel, Le Dome, Montana Cafe, Butterfield's and the Ritz Carlton in Marina del Rey, before opening his first little place in Downey. He got a lot of help from the city of South Gate and the management of El Paseo shopping center in opening his new place, Mirzaie said. Their confidence in him has paid off in a great restaurant, already of the top fine dining places in this area.